On Tuesday afternoon, my wife and I were walking down Gerrard st East , a local strip we often visit for the great restaurant options. En route we walked past a renovated building with a large paper covering the front window reading: Retail space for Rent. 1100 Square feet on the main floor with an additional 350 + downstairs. Phone: 8675309-etc…. We wondered what the odds would be if this location was still possibly available. And no, that isn’t the actual phone number that was posted. This stretch of Gerrard street East is developing so fast with all of the new restaurants and bars and retail shops. Lots of new condos and townhouses being built in the area. We couldn’t even guess what the cost would be and what details and unknowns were waiting behind this papered glass wall. You see, quite ironically ( or not at all ) about four hours earlier, I received notice from our current landlord letting me know that our lease was ending at the end of the month and our rent would be increased by 10% this year and 5% each additional year thereafter. ?!?! That didn’t sit too well for a variety of reasons and I immediately wondered if this current situation was going to work moving forward. Three years in this Industrial space. Lots of great memories but the new cost simply couldn’t be justified. So back to Tuesday, early afternoon and we see this building with it’s brand new front all papered over… I think the universe was listening. First things first we phoned the number and actually spoke to someone! Not a machine, not a recording….this was a good sign indeed. But it did on Tuesday. Now we’re getting excited to see the space and all of the wonders and questions start bubbling up. A few minutes later, we’re greeted by the landlord and he welcomes us in to see the space. 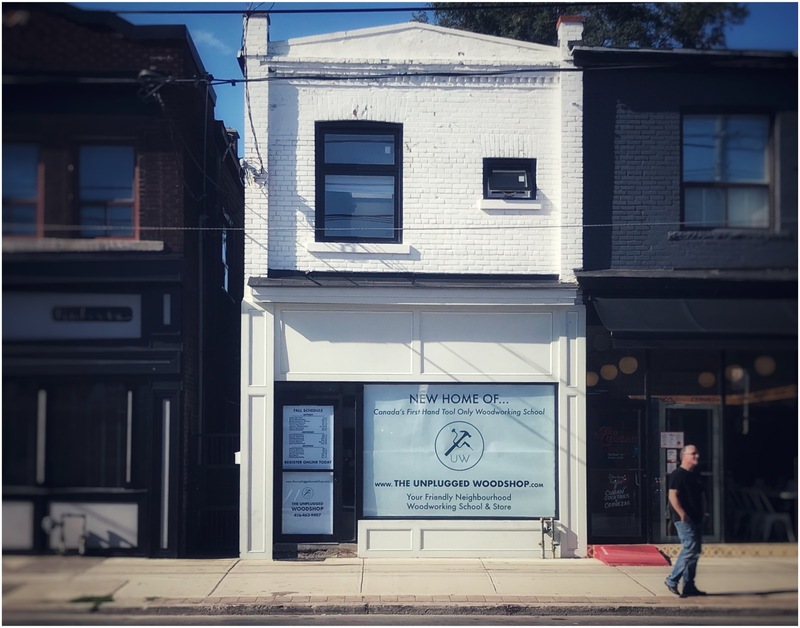 It’s a typical Toronto building, probably a little over a century old, brick structure, split levels on the main and basement due to the lay of the land. It’s about 15′ wide inside and long like a bowling alley. It used to be a Canton Chinese Medicine and Acupuncture Center. Good bones and good vibes. Back to the tour, we walk in through this brand new glass exterior. A South facing window with a glass door and vestibule that creates a wind barrier between the sidewalk weather, the noise, etc. and the inside of the building. The place had been gutted all the way down to the bricks. They left them exposed for the first 8 feet or so which is always a nice touch, and beyond that is fresh drywall, plywood flooring, but still no plumbing or electrical……yet. I notice a brand new furnace with restaurant style ductwork running the entire length of the space. Climate controlled, heating and air conditioning. That would certainly be a welcome change! Could we really consider a move like this? Classes start in four weeks! Take a deep breath, close your eyes, and just…………breath. On with the tour, the space is smaller than our current shop but the pros far outweigh the cons. In fact at this point there really isn’t any cons! You see the rent for this new space is less than what we’re paying here!! How is that even possible? Beyond the curb appeal and the fact that we’ll literally have 100% more walk by traffic, the new place will actually be saving us money. It will be intimate and efficient, focused and inspired. My head is still spinning as I write this and think back through the week but we’re all excited to say the least. The new landlord is sending a crew there this coming week to do all of the plumbing and electrical, pour the new cement floors in the basement, install the new bathroom and furnace room, install the school and shop space lighting and electrical, the list goes on and on and probably will for the rest of the week. The main construction work will be done by the end of this week and then we’ll have two weeks to install some flooring and some other essentials we’ll be doing ourselves and then we’ll move the school/shop/everything else over the last week of September. Incredible. So here we are today, on Saturday morning and I’ll say it again – what a difference a few days can make! Life is truly an amazing place. On Thursday afternoon we signed the new lease. 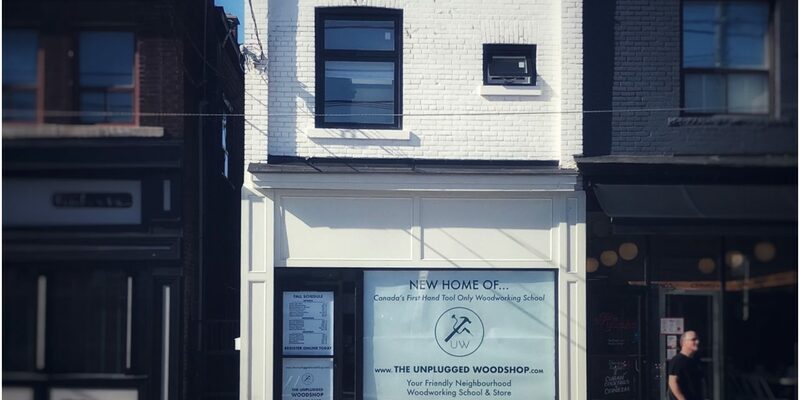 The new home of The Unplugged Woodshop Toronto. It’s going to be a busy few weeks but I’ll keep turning on the camera and showing you all of the process and progress. This isn’t a tour of the new space, in fact the only photo I took was the one at the top of this post. I’ll go over in the morning and give you a tour before the construction finishes off. That way you can see some of the before and after. Did I mention the little backyard? We have a cherry tree! Stay tuned and thanks for all of the support through this incredible adventure. Sounds like another amazing opportunity for the UW. A backyard sounds like a great place for a veggie garden. Tom haven’t been in your space in sometime now that I live 3 hours North but good luck finds good people. I for one will not miss that’s long walk to the loo ! Congratulations to you both. Can’t wait to see the new space when I get a chance to come by for another class in the future. I hope the increased foot traffic helps the business go to the next level for you guys. In that vein – have you thought about doing you main courses like the artisan as a multiple weekend course – I’d be up for that…. So cool! Very happy for you guys and wish you the best of success in your new location! Btw, I called the number but Jenny’s not home. It is a wonderful part of life when good things happen to good people and when some of our scariest moments lead to incredible growth and opportunity. So happy for you, yours and the school. We spoke a couple times nearly a decade ago and thinking back on your story, this makes perfect sense. What a great news Tom. I was so happy for you guys reading this post… -I know you’re not alone, you got some Oopa lumpas under the bench to give you a hand when needed. All the best for this new adventure Tom and all the oompa lumpas you secretly hide under the bench. All I can say is WOW,, Exciting! I hadn’t heard of your company until I walked by 1028 and saw the signage! Welcome to the area! Great concept. Wishing you great beginnings in your new home. Congratulations on finding such a nice building.